Home to some 15 million people, New York City is one of the most vibrant cities in the world and is a major commercial, cultural, and financial center. Given its incredible density, running along the main streets of Manhattan can be a challenge. 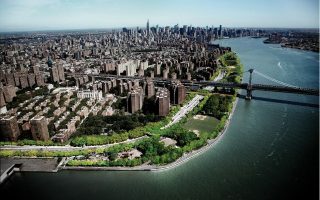 But, there are some iconic and inspiring places to go running in Manhattan, mainly in Central Park and along the wonderful and continually improving greenways along the Hudson River and the East River. It is possible to run nearly the entire length of Manhattan on off-road paths. Our guide to running in New York City is divided into two parts: the island of Manhattan, and the other four “Boroughs” — Brooklyn, Queens, the Bronx, and Staten Island. 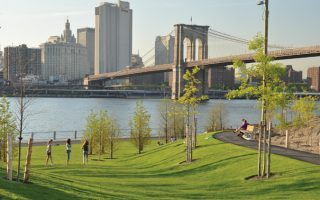 In Manhattan, there are four “must-do” runs: Central Park (numerous options); the spectacular run on the west side along the Hudson River Greenway, with views of the river, New Jersey, and the new One World Trade Center; the East River; and a run incorporating one of the bridges crossing over to Brooklyn. We’ve also added some routes at the northern end, around Fort Tyron Park and a crossing over the George Washington Bridge! The Manhattan topography is very flat. Any hill options are generally in Central Park. And the fantastic subway system (called the MTA) can make getting to or from any run a snap. All of our routes are easily accessible by subway. View our companion piece, covering Brooklyn, the Bronx, Queens, and Staten Island. Or hop across the river for some fabulous runs in New Jersey! Our guide to the other New York City Boroughs: Brooklyn, Queens, the Bronx, and Staten Island. Nearly 20 additional routes featuring parks, waterside runs, and other major attractions. Most accessible via public transport. 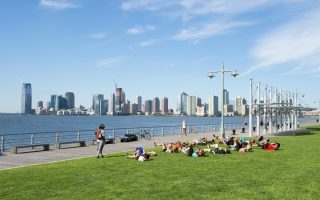 On Manhattan's west side, fabulous esplanades for walking and running with beautiful views of the river, the New Jersey skyline, and Freedom Tower. It's possible to run 12 miles from Lower Manhattan to George Washington Bridge. 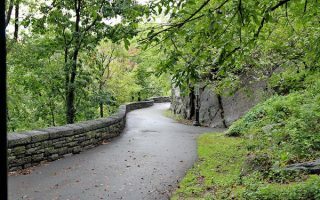 Great running alternatives at the northern end of the Hudson River Greenway: Fort Tyron Park's 8 miles of paths and killer stairs, and Inwood Hill Park's wooded trails. And it IS possible to run over the George Washington Bridge! A car-free waterfront esplanade along Manhattan’s east side, from Battery Park in the south to 125th Street in north, with a 1.2 mile-long gap near the U.N. HQ. Some sections are spectacular, others a little more industrial and being improved. Incorporating one New York’s iconic bridges is an integral part of the running experience in New York City. Brooklyn Bridge is a ‘must do’. This nearly 4-mile run features the Brooklyn and Manhattan bridges. A fabulous run with water and skyline views. It’s about 4 miles around the perimeter, with parks on each end. To access the island by foot you have to cross the Queensboro Bridge. Or, access via tram or subway. 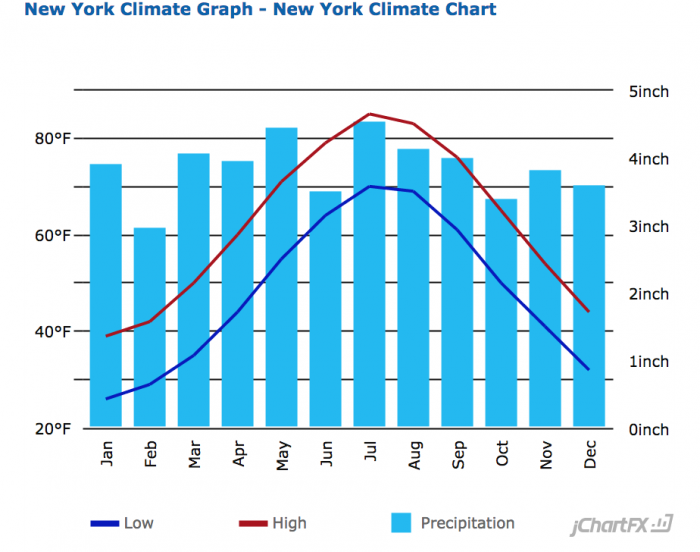 New York City has a humid subtropical climate, being the northernmost major city in North America with this categorization. Summers from June to August are typically warm to hot with some periods of high, uncomfortable humidity. Temperatures average in the 80s in summer. Winters are cold and damp, with average January highs in the 30s (4C) and lows dipping below freezing. Surface conditions can get icy but don’t stay that way for long. New York averages 25.8 inches of snowfall. 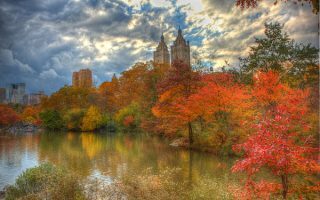 Spring is unpredictable but autumn is gorgeous and lingers well into November. Humidity is a factor, especially in summer. Another factor is the buildings — they create shade and shadowing from the sometimes oppressive sun. Far be it from us to recommend where to stay in New York. Some 50 million people visit New York annually, and there are nearly 300 hotels and 75,000 rooms. There are hotels all over Manhattan, at various budget ranges. 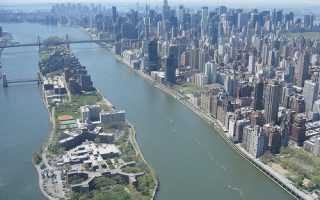 For runners, it is important to be within a few blocks of Central Park, the West Side Highway, or the East River paths. If you want to be within proximity to Central Park, look for hotels between 50th and 115th Streets (and in the 50s-70s to be close to Columbus Gate), between 3rd and 8th Avenues. For the West Side, try staying west of Broadway, and for the East Side, stay east of 5th Ave. You will be most ‘landlocked’, as in, not close to any of the iconic routes described here, if you are in mid-town. New York features a wide selection of running and athletic retailers from smaller specialist stores to multistory flagship stores of world’s largest sporting goods brands. New York Running Company. Knowledgeable staff and treadmills for gait analysis. Located on Columbus Circle at Central Park southwest corner. Provides storage lockers for leaving your belongings if you go out for a run. Group runs, too. Nike Town. Nike flagship store located a few blocks from Central Park‘s’ southeast corner. Multiple group runs every week. Super Runners Shop. 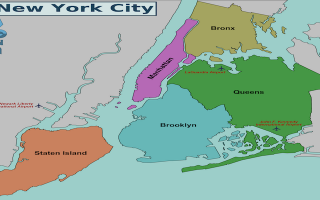 Several locations in Manhattan and one also in Brooklyn. Offers complimentary video gait analysis. Jack Rabbit. Several running stores in New York City, including Union Sq., 72 St., East Side, Columbus Circle. Has group runs, gait analysis, bra fitting and nutrition advice. Group run calendar. City Running Tours NYC. Huge number of group runs, with various touristy and fun themes, for a fee. They can also be booked for customized individual and small group runs. New York Road Runners (NYRR). Non-profit running organization, conducts over 100 events each year, including classes, clinics, and races. The Reservoir Dogs. A midsize running club consisting of runners of all levels. Arranges several group runs each week in Central Park, some of them followed by food and drinks. The Most Informal Running Club, Ever. NYC. As the name suggests, it is all about running and community. No fees, no other requirements. Because NYC attracts so many visitors, it is a great place to host some major running events! United Airlines NYC Half March. Airbnb Brooklyn Half May. Starts in Prospect Park. Queens 10K June. A speedy course through beautiful Flushing Meadows Corona Park. Scotland Run 10K April. Runners bring the feel of Scotland stateside, donning their kilts, waving Scottish flags, and even painting their faces in the white and blue of Saint Andrew’s Cross.